… it was done so with the blood of our forefathers. We, and when I say “we” I'm lovingly referring to the people who bought our freedom all those years ago, went to war with tyranny to claim the rights guaranteed in the Constitution many of us now take for granted. And that document, that Amendment, that Constitution is all that stands in the way of those who'd take our freedoms away in an instant. New Zealand doesn't, to my knowledge, have one and they're about to have their guns stripped from their very hands. 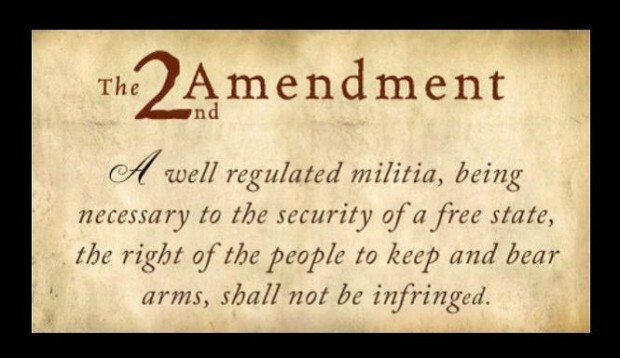 In fact, only a few countries guarantee the right of the people to keep and bear arms. There are only a handful, of which we are one. This matters even more when you take into consideration that our Constitution was written in blood by our forefathers who are likely rolling around in their graves right about now, trying to figure out just what is going on. The Constitution, and the Second Amendment in particular, is viewed by the gun grabbers as an obstacle to their end goal. I'm not going to discuss the goal because we all know it. Less than a week after the shooting in New Zealand, their officials announced that all “military style weapons” will be banned. These efforts are applauded by the gun grabbers in our own country. I'll get back to my original point in a moment but I'm going down a rabbit hole for a minute. I want to take a moment and help try to explain the “why” behind her inherent question about why it's been 6 years and the senate won't vote on a background check law. Ya know, just in case she reads this. The Senate won't vote on gun measures for a couple reasons. The first one is common sense. History tells them that if they did, it will piss off the wrong people and a civil war could start. I'm pretty sure nobody wants that. Second, is fear. It's closely related to the first reason, but this one is a bit different. NRA's 5 million+ members aside for a moment, there are millions of other un-affiliated gun owners in the country. Many of them share the same belief system to some degree–they at least believe in the right of the people to keep and bare arms. Guess who'd get voted out of office if they gave in to you and the people YOU represent? Also try to keep in mind, Ms Ocasio-Cortez, that at least half of the gun owners out there are pissed that they didn't take action on our behalf to get something done FOR US while they had control of both houses. In other words: 6 days, 6 years, or 6 decades–it doesn't matter. It doesn't matter because we won't allow it. Notice that little part there where she says “semiautos” and not AR-15 rifles? Yeah, just making sure we're on the same page. She, and other gun hating people, are the future of leadership for our country and she blanketed all semi-automatics in one statement. If you don't think we've got an uphill battle ahead of us you're sadly mistaken. There's another point, too, that I haven't heard anyone else reference to date. And, that's the fact that the New Zealand shooter wrote up a manifesto telling us what his goals were. His goals, if you didn't know, were to cause discord in the US between pro gun and anti-gun groups. I wonder if that's why major media outlets told us not to read the manifesto and were trying to take it down? Won’t your attack result in calls for the removal of gun rights from Whites in the United states? Yes, that is the plan all along, you said you would fight to protect your rights and the constitution, well soon will come the time. In other words, he's trying to start a civil war. He thinks that if we have a civil war in America that the rest of the world will also have tremendous issues. You can read the entire thing, here. I'm not saying that I agree with anything he said, he was clearly a nutjob bent on wreaking havoc not just in Christchurch, NZ but around the globe. They don't want us to read the manifesto because they don't want us to see the obvious, which is that each time guns are used in crime it serves as ammunition for the gun grabbers. Cling to your freedoms, my friends. Cling to your guns. They will continue to use crazy people killers against those of us who just want to protect ourselves, until they finally win. However, as long as we have a functional Second Amendment and Constitution, we'll be fine. That's their obstacle. We must cling to it, and do all we can to protect it. Stay in your politician's ears and eyes the best you can. If that pesky Second Amendment goes away, the guns will follow. Then it's only a matter of time before the rest of our rights fall away, as well. To add an unusual twist, my question is, if military style firearms were banned in the U.S. would that only be modern military or possibly WWII maybe WWI? Possibly any firearm used by any military faction at any time of modern history. All I can say is I’m moving to Maine, Constitutional carry hunting fishing and firearms, no problem, sick and tired of these laws period!! I want to be FREE!!!! That is one of the MOST illogical actions any Government could take. IT only affects the honest people. The bad dudes are still going to be bad, the local law enforcement will NOT be able to adequately protect the citizens and basically you get the Government siding with the criminals. I would MOVE the hell out of a country that sided with criminals and impeded my ability to defend my life and the lives of others. The Senate won’t vote on gun measures for a couple reasons. The first one is common sense. History tells them that if they did, it will piss off the wrong people and a civil war could start. I’m pretty sure nobody wants that. Second, is fear. It’s closely related to the first reason, but this one is a bit different. NRA’s 5 million+ members aside for a moment, there are millions of other un-affiliated gun owners in the country. Many of them share the same belief system to some degree–they at least believe in the right of the people to keep and bare arms. Thomas Jefferson said The first to prevent tyranny is to educate the Masses. He also said, Those who beat their guns into ploughshares, will be ruled by those who don’t. The Constitution was written to protect the people from power hungry socialist creeps like A.O.C. She sure needs no armed security for herself! The only people gun confiscation hurts is the law-abiding, as the criminals,gang members and crappy politicians like Cortez will get guns whenever they want to abuse people!